Branches, Inc. is proud to have been selected as a Macy’s grant recipient to support both its Grow & Climb children and youth programs in South Miami. Macy’s is a wonderful community partner and has helped to support Branches’ student programs for several years. 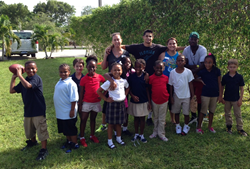 Branches South Miami students and staff stop and smile for the camera. “We are honored to continue to work with Macy’s towards making an incredible impact in the lives of children and youth in our South Miami community,” said Brent McLaughlin, Executive Director of Branches, Inc. The Grow Program provides afterschool tutoring, mentoring, enrichment and academic support to elementary students 5 days a week. Summer Shade, a 7 week long day camp provides fun and enriching activities during the summer break and also helps prevent summer learning loss. The Climb Program provides social/life skills, academic support, college readiness, service learning and other enrichment to middle and high school students to help them become better students and better people. These programs serve over 50 students at Branches South Miami, located at Mt. Olive Baptist Church in the Marshall Williamson neighborhood. Branches is a non-profit organization based in Miami and primarily focuses on student services and financial stability. Its Grow Program serves elementary students, preparing them for lifelong success through enrichment of their minds, bodies and hearts. The Climb Program serves middle and high school students, focusing on the development of their individual assets. Branches’ Achieve Programs target the well-being of the entire community through services fostering financial stability and long term success. Services include the ASSETS small business development program, free VITA tax preparation, and hunger relief. Branches is also proud to house and operate the United Way Center for Financial Stability (UWCFS). For over 40 years, Branches has made a positive impact in the community by delivering on its mission to serve, educate and inspire people through student, family and financial stability services. Branches provides long-term, holistic services for motivated individuals and families. We help people grow deeper and climb higher in life by building a foundation through education so they can achieve their goals and fulfill their potential. For additional information about Branches, please call 305.442.8306 or visit http://www.branchesfl.org.